Built on the site of the Alhambra theatre, the Odeon opened in November 1937 with James Bell at the impressive 5 manual console of the Compton organ. Unfortunately James Bell collapsed immediately after a broadcast on the morning of September 22, 1947, and died later in hospital. He was succeeded by John Howlett who remained until October 1958, and from November that year Gerald Shaw was appointed organist until his untimely death, aged 63, on 26 April, 1974. At the time of his death, Gerald was officially the last full-time cinema organist in the UK. David Shepherd and Bernard Tilley continued to feature the Compton throughout the 1970s and organist and organ builder Ronald Curtis played three times daily during the 43rd birthday week in 1980. Ron Curtis added three extra ranks from the Odeon Twickenham Compton after flooding of the chambers in 1981, having carried out repairs to the organ. These additions were subsequently removed to restore the Compton to its former specification. Throughout the 1980s the organ was featured by Peter White and Victor Patterson and from 1992 Donald Mackenzie has been associated with the Compton, eventually being appointed ‘House Organist’. It is thought that the original wooden Tibia may have replaced by a Wurlitzer one from the Gaumont Watford in 1955, (although Gerald Shaw said this was not the case) but, either way, this was later exchanged for another wooden Compton one, this time from the Gaumont Finchley. It is certain, however, that the Krummet was replaced by a better one and the piano was replaced with a Marimba both from the Compton of the New Victoria cinema SW1, whilst a set of Chimes and a Chrysoglott were ‘borrowed’ from the Christie organ of the Regal Marble Arch during 1960, the same year that the Melotone was refurbished. Many famous names have appeared in concert at the Odeon, firstly arranged by the COS in conjunction with Gerald Shaw, then by Rank Leisure themselves, and more recently concerts and special organ featured events have been presented by the cinema. One unique feature of the Odeon’s organ is that, when not in use, the console is ‘parked’ in the basement. The floor of the orchestra pit opens and the lift takes the console even further down, then closes over it again and one would never know it was there. 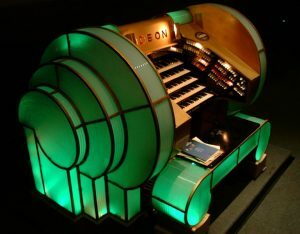 There are stories of at least one relief organist who turned up at the Odeon and, upon seeing no console, promptly left again! The Stockport Plaza .The Odeon Leicester Square and the Odeon Weston-super-Mare.